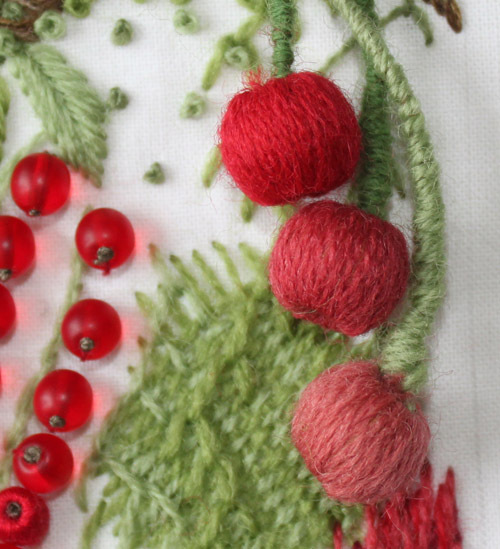 I am posting my July embroidery journal project today. It was a bit of an experiment! The idea of red stuck in my head. I wanted to do something with summer fruit. 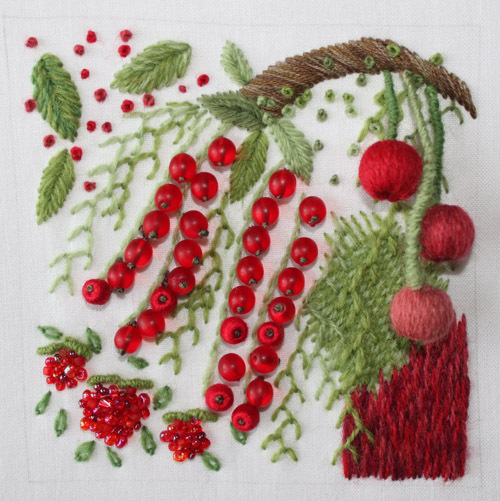 I ended up with currants, raspberries and cherries represented in this little project. I was a bit free with my interpretation as you see. Actually I really wanted to do just the currants like in one of the photos I pasted in my little book using a bunch of beads, but it didn’t quite work out. 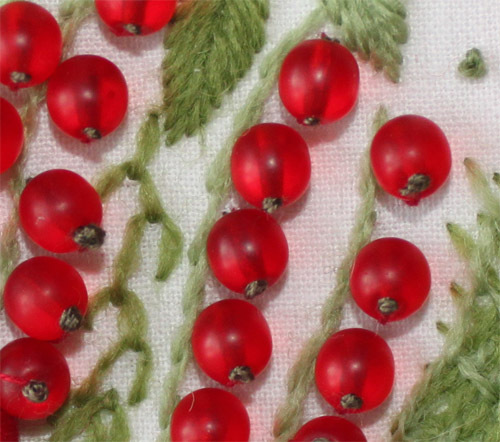 I covered some wooden beads with crewel threads, and they were too big to fit with the smaller beads, so they became cherries. I wrapped up the stems in some thread and attached them. They are a little floppy, but I like how they look. I will definitely find a way to use that idea in another project. My lines of currants actually look kind of cool. They look realistic, so something esel I can use too. I have made a couple watercolors too with red fruit and a mushroom. I’ll get those scanned. I’d say I’ve learned a lot about working with colors! I don’t know if I will continue making more color pages with other colors, maybe. This was mostly a fun exercise to do while I taking a break from the usual tasks. I will say though, that I feel myself noticing the color around me much more. It’s so easy to just dismiss things as being one solid color, but they aren’t, and the light changes the color we see. It's the colour changes that make the world so interesting! WOW! Using those clear red beads was a great idea…the color and translucency (is that a word?) is perfect. Makes me want to reach out and pinch it off the stem. I also like the diversity of color and texture between the three fruits. Yum! I was impressed by how realistic the currants are. We don't really have them in the US so my only experience with their sheer awesomeness is from a trip to Poland many moons ago. But yours made my mouth water! Red is not my favorite color, but that is beautiful! My favorite are the currants. I used to love picking them when I was younger! You can still get them here (upstate NY – USA) but they are more of an heirloom fruit – if you're lucky you can get some at the local farmer's markets…. This is lovely, Emily. I especially like how you've blended different shades of green and brown on the leaves and stem. And the currants do look good enough to eat! Thank you kindly for the comments!! To be honest I didn't think this project was that "good"!!! It felt a little like a random mess, lol!